for three in the window. We loved this British style tea house. It reminded us of many similar tea rooms in England. Each of us ordered a different tea. There were 50 teas to choose from. AJ ordered the traditional English Yorkshire Gold. and I ordered English Breakfast. and to be able to enjoy a nice pot of properly brewed tea. We all ordered The Meadowlark Tea, a full afternoon tea. This tea experience began with a mango sorbet. Two savories and four tea sandwiches were on the bottom tier. The tea shop is filled with teas, tea pots and tea-time gifts. The antique shop was stocked with all sorts of treasures. and a separate dining room for private parties. The owner, Sharon, is a delightful English lady. Her staff is very knowledgeable and friendly. The chef sent AJ with a to-go baggie with fresh from the oven cookies. Oh, how I wish we lived closer to this tea room! Sharon's recipe for scones is her aunt's recipe. It is the perfect English scone! just a short drive from downtown Portland, OR. Beautiful! Love all the pictures. Yum! This looks like a great teatime spread, and that rose cupcake is so pretty. Wish I knew how to make those! What a wonderful tea room! It has everything -- great tea, delicious food [those scones looked divine!] gift shop, and antiques! Thank you for sharing this wonderful tea room that's not far from my home. It will be one of my stops soon! This is about 10 minutes from my house and I have never been here. Now I must go. This is the tearoom that once belonged to Jennifer Peterson, so I have been in this building many times. Everything looks delicious. Oh, Linda! Cupcakes with roses piped on! I've been meaning to mention that I've just discovered Dickinson's Lemon Curd---absolutely divine. They DO make the best strawberry preserves there are, so I trusted the name, and was well rewarded. What a lovely tea, Linda! Everything looks wonderful and how nice to share it with loved ones. I enjoyed your photos. Love your TEA HOUSE visits! My daughter is moving back to WASH from Okinawa soon...when I visit I will have to go to this place. The food looks so yummy and delightful in decoration too! How lovely and yes those scones look like perfection on a plate. So glad you were able to find such a lovely place for the quintessential Afternoon Tea. And the Rose Cupcake . . . So pretty! Kudos to Sharon for all of her hard work and dedication to the Art of Teatime. The food looks scrumptious! And those tea cozies look like they are similar to the ones I've made. 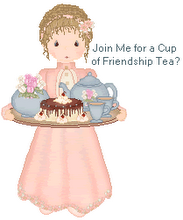 It's so nice that AJ and GJ are willing to go with you on your tea outings! Glad you are enjoying your visit to the Pacific Northwest!